Born in Massachusetts, Yankee Candle is a long standing favourite amongst candle lovers. Built on creating memories, the right Yankee Candle jar has the ability to take you back to a special Christmas or to set the perfect mood. Delivering a variety of fragrances and candle types to suit all types of personal preferences, settings and budgets too - there’s a Yankee Candle for everyone. If you’re familiar with Yankee Candle, then you may have already found your favourite fragrance. Is it Black Cherry that you’re never without? Or is it one of the stunning Scenterpiece designs that perfumes your home on the regular? From the cult-classic candles to accessories and the innovative flameless range - there is lots to discover online. Shop by Fragrance family, by occasion, or even by colour and you could bring a little more light to your life with Yankee Candle. How do I use my Yankee Candle promo code? Add your favourite Yankee Candle scents to your bag then go to checkout. You'll be able to enter your promo code in the order summary section. Click ‘Apply’ to verify your discounts and continue to checkout. Sign up for Yankee Candle emails and stay in the loop for sweet savings on your favourite fragrances. Are there Yankee Candle reviews? How long will my Yankee Candle burn for? Your large jar will last you 110-150 hours, while a wax melt will give you 8 hours of bliss. Different candle formats have different burn times which you can check online. Are there Yankee Candle stores? To find your local Yankee Candle stockist, simply use the store locator online. Yankee Candle free delivery is available on orders above £20. Email Yankee Candle: consumeronline@yankeecandle.co.uk or fill in the online form. There’s nothing quite like lighting your favourite Yankee Candle. 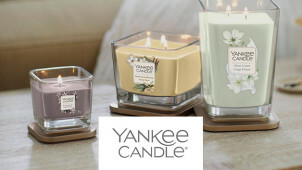 One of the UK’s favourite candle brands, now you can enjoy the best Yankee Candle scents for less with vouchercloud. Pick up a Yankee Candle discount code to save on your large jar, wax melts and all rest rest. From classic originals like Clean Cotton and Soft Blanket, to limited edition Christmas candles and accessories too - there will always be something new to bring to your home from Yankee Candle. You can make a Yankee Candle even more special. Gift another and invest in a unique, personalised photo candle. Sure to create fun, joyous memories - depending on the picture! - this is a one-of-a-kind gift that’s sure to bring happiness. Choose their favourite fragrance, or take a wild guess and surprise them even more, this present really is picture perfect. If you like to keep your home decor on trend each season, then Yankee Candle fragrance of the month is just for you. Delightful fragrances each month, for less with your Yankee Candle promo code - because no one should be without a delicious home fragrance after all. From Yankee Candle Christmas candles, to the latest spring picks, summer and autumn favourites - stay with the times and your candle budget won’t burn out so fast!